Canadian Craft Museum, Toronto, 1992. The jet-black intensity of the material links this example to three others in similar black nephrite, all of which are extremely well hollowed and carved with perfect symmetry. Compare two in the collection of Mary and George Bloch, illustrated by Moss, Graham, Tsang, A Treasury of Chinese Snuff Bottles, Vol. 1, Jade, nos. 160 and 161; and a third in the J & J Collection (see Moss, Graham, Tsang, The Art of the Chinese Snuff Bottle. The J & J Collection, no. 58. Intensely black jade is sometimes found as a skin-color on pebbles of nephrite, but in this case the stone is black through and through. 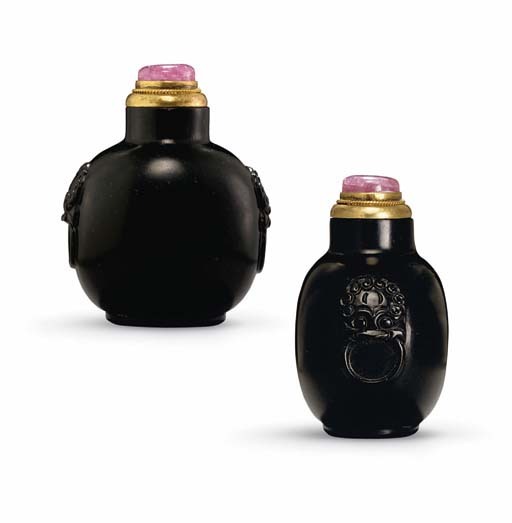 Black jade is relatively rare and was highly valued, and used in the Qing dynasty, particularly at Suzhou, for a range of snuff bottles where the black is contrasted with grey or white layers. This stunning example of completely flawless, jet-black nephrite would have appealed to Qing taste in jade. The classic form of the bottle is simply decorated with two mask-and-ring handles, raising the probability that it was made for a northern, possibly courtly, audience. See a jet bottle of similar form, formerly from the collection of Dr. and Mrs. Stephen Weisz, illustrated in the exhibition catalogue, Robert Hall, Chinese Snuff Bottles III, p. 140, no. 83.